Sean Rayford/Getty ImagesPresident Donald Trump was a millionaire by the time he was 8 years old, according to an expansive report from The New York Times. A new bombshell report from The New York Times on President Donald Trump’s finances questions his claim that he’s a self-made billionaire. The report says that Trump’s father lent him about $US60 million, far more than the “small loan” of $US1 million he claimed during his presidential campaign that he had received. The Times also found that if Trump had done nothing but invest the money his father gave him in an index fund that tracks the S&P 500, he’d still be worth about $US2 billion today. Overall, Trump received about $US413 million in today’s dollars from his father’s real-estate empire, largely because he helped his parents evade taxes, The Times’ report says. Forbes estimates that Trump’s net worth is about $US3.1 billion. A new bombshell report from The New York Times on President Donald Trump’s finances questions one of his fundamental claims: that he’s a self-made billionaire. According to the report, published Tuesday, Trump received far more money from his real-estate-mogul father than he has previously acknowledged and was a millionaire by the time he was 8 years old. Trump once claimed that his father gave him a “small loan” of about $US1 million to help him get started in the real-estate business, but The Times’ analysis found that “Fred Trump actually lent him at least $US60.7 million, or $US140 million in today’s dollars.” Much of this loan was never repaid, the report said. The Times said that if Donald Trump had done nothing but invest the money his father gave him in an index fund that tracks the S&P 500, he’d still be worth about $US2 billion today. The Times said its report was based on hundreds of thousands of documents on Fred Trump’s business empire, including mortgages and deeds, probate records, financial-disclosure reports, regulatory records, and civil-court files. The Times said it also interviewed Fred Trump’s former employees and advisers and analysed tens of thousands of confidential records, including bank statements, financial audits, accounting ledgers, cash-disbursement reports, invoices, and canceled checks. “Most notably, the documents include more than 200 tax returns from Fred Trump, his companies and various Trump partnerships and trusts,” the report says. 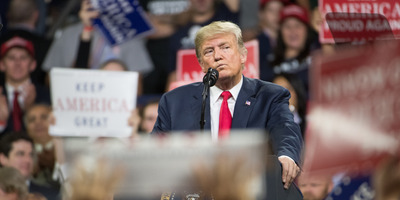 The report found that the president over the course of his life received $US413 million in today’s dollars from his father’s real-estate empire, much of which The Times said was acquired because Trump helped his parents dodge taxes.